use for dives in the Galapagos. wildlife in the Galapagos; horseback riding in Baños; real steam bath experience. flights; bus ride from Ambato to Guayaquil. Best Moment: My Galapagos trip (specifically - swimming with the sea lions)! getting it on with his lady tortoise friend. different towns/cities at the bus station. (fish); 'vavaca' fruit??? ; real hot chocolate. Purchases: Two underwater camera; pair of earrings. Fun Food Finds: Sugar cane taffy (in Baños); pieces of sugar cane. Western Companies Out Here: McDonald's; KFC; Payless Shoe Source. Type of currency? U.S. Dollars (how easy!). Wallet Friendly? Compared to Chile? Yes. Compared to Peru and Bolivia? Not as much. 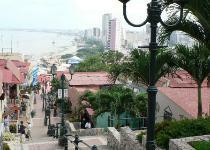 Things Ecuador Is Known For: Galapagos Islands; the equator; the jungle. 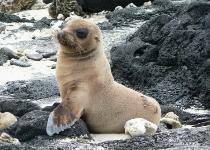 A sea lion pup in the Galapagos. 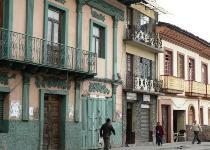 The colonial architecture in Cuenca..